Home › WRITINGS › NEWS COMMENTARY › Who Are the Real Supporters (and Beneficiaries) of Anjem Choudary’s Career? It was recently announced that Anjem Choudary, the former head of the now banned UK based group, Al Muhajiroun (AM), has been convicted under the UK Terrorism Act of 2000 for inviting to the support a terror group by publicly pledging allegiance to Abu Bakr al Baghdadi and inviting others to do so. This comes after a 20 year career by Anjem, who is known for inciting public outrage in the UK, having connections with many individuals who became terrorists, and being constantly in the attention of media and political discussions over counter-terrorism and ‘anti-extremism’. However this is where the facts end. Off of the back of the conviction, a popular narrative was spun, claiming that Anjem was allegedly able to avoid prosecution for 20 years, by his abusing the UK’s ‘free speech’ and supposedly ‘clever’ avoidance of his public speeches falling foul of the law. Anjem is then portrayed, according to this narrative, as having used his ‘free speech’ to preach an “extremist ideology” that radicalised many unsuspecting and impressionable youth to take a path into terrorism. Predictably, the narrative ends with the Muslim community being blamed for “not doing more to control Anjem Choudary”, and is also being partly to blame since Anjem’s “extremist ideology” is allegedly shared with “many within the Muslim community”. However, this narrative on Anjem’s story is not only inaccurate, but not quite what it seems. In 1996, Omar Bakri Muhammed founded Al Muhajiroun (AM), soon after Omar recruited Anjem into his organisation, and he soon became his lieutenant. The mission of AM was ostensibly to change the UK into an Islamic government and establish a Caliphate there. Omar Bakri had admitted an interest in ‘Jihadism’ since his arrival in the UK in the 1980s, and admitted sending ‘hundreds of volunteers’ to Chechnya to join the International Islamic Front, which was led by Osama Bin Laden. In 1998, Omar Bakri issued a joint fatwa supporting Osama Bin Laden’s call to strike at American targets globally. Omar Bakri and Anjem strongly criticised the Islamic group, Hizb ul Tahrir, who had previously rejected them from their ranks. While Hizb ul Tahrir aimed to re-establish a Caliphate in the Muslim world, Omar Bakri and Anjem desired to establish an Islamic Caliphate in Britain. From the outset, Omar Bakri and Anjem attempted to attract members and supporters to its ranks by employing hyperbolic rhetoric and gratuitously provocative public relations strategies. The idea behind this, was to offer a sense of superiority to Muslim youth, usually those possessed of low self-esteem, narcissism or disenfranchisment, by giving them a sense of psychological ’empowerment’. What many failed to realise at the time, was that AM’s strategy behind the use of provocative tactics, was to recruit Muslims with grievances to his cause. These grievances were in most cases pre-existing, Muslims were angry at the plight of the Palestinians at the hands of Israel (with U.S. support), the U.S. propping up of dictatorships in the Muslim world, then later, the invasion of Afghanistan and Iraq, and the huge numbers of dead Muslim civilians that resulted from the ‘War on Terror’. AM’s strategy would be to exploit these grievances by promising Muslims a gratuitous and crudely cathartic ‘outlet’ for their anger, thereby attracting Muslims to AM’s ranks. The 9/11 attacks and the subsequent ‘war on terror’ launched by the United States was a significant turning point, and enabled AM to take advantage of Muslim discontent over the U.S-led invasions occurring against the Muslim world and the high amounts of Muslim civilian casualties that ensued. This began the start of an increasingly provocative and deliberately insulting public demonstrations and campaigns by AM, ranging from AM publicly celebrating the 9/11 and 7/7 attacks and praising attacks made against Britain and the U.S.A, holding placards calling for ‘beheading those who insult Islam’ and ‘promising’ the wider public of an imminent take over of the UK by Muslims. AM, continued its deliberate campaign of provoking public outrage, and changed its name a few times to avoid being banned, but was finally banned by the UK government in 2010. Before AM became known as supporters of terrorism, the wider Muslim community already held strong reservations against AM’s tactics and rhetoric. Despite Islam commanding calling to goodness using ‘fair speech’ and discoursing in better ways than crude argument and disputation, AM would do the exact opposite, using deliberately insulting and provocative events, designed to not win over people to their message, but gratuitously insult and offend. It is not just provocative actions and rhetoric antagonising wider society that has earned Anjem Choudary and AM the ire of Muslims in the UK, but also their unIslamic ideas. AM’s founder, Omar Bakri Mohammed, has claimed that Muslims must shake non-Muslim hands only with the left hand, because Muslims use the left hand for bathroom-related self hygiene and the gesture would be a mark of disrespect (which is no where found in any Islamic texts). AM also, quite scandalously, claimed that the Quran requires Muslims to break wind in the direction of non-Muslims (it doesn’t). However, eventually the Muslim community came to know and widely revile the more egregious ideas of AM and Anjem and their support and glorification of terrorism, when the former-leader of AM, Omar Bakri Mohammed, began openly calling the 9/11 hijackers as ‘the magnificent 19’, and the 7/7 bombers, as ‘the fantastic four’. This public rhetoric stopped after 2006, when the UK introduced the law abolishing the glorification of terrorism. However, Anjem continued this rhetoric in different forms, exclaiming that he was ‘proud’ of the killers of UK soldier, Lee Rigby (who were noted to have attended AM demonstrations in the past). 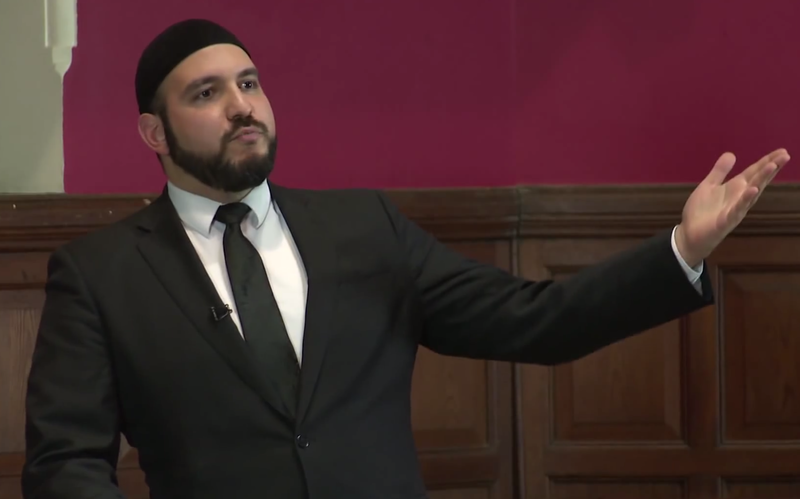 He also argues that Al Qaida and ISIS’s call to attack civilian targets in the West is an acceptable ‘difference of opinion in Islam’ – despite the targeting of civilians being completely prohibited by Islamic text and scholarly Islamic consensus over 1400 years. Anjem’s antagonising activities were regularly highlighted by the media, and even facilitated. The fact that AM and Anjem Choudary lacked any serious representation in the Muslim community, did not prevent the media’s disproportionate coverage of them. Even Neo-conservative Douglas Murray lamented that the media has made Anjem argubly “Britain’s most famous Muslim”. AM and Anjem then developed a symbiotic relationship with the mainstream and right wing media. He provided them material to anger and frighten the masses, confirming their fears and prejudices, helping the media outlets to sell newspapers, gain ratings and enabling the furtherance of UK government policies and laws more in line with the ideological perspectives of the tabloids ‘reporting’ on Anjem. Such policies would be related to controlling immigration, cultural assimilation of minorities, and silencing Islamic intellectual discourse where it dissents under the guise of rooting out ‘radicalising ideas’. In return for this faustian pact, AM and Anjem would reap the benefits of media attention and attract even more attention and social dejects to themselves. According to many former associates, AM and Anjem would deliberately play upon the very fears of UK society, holding placards claiming “Europe you will pay, your 9/11 is on the way”, or “Freedom go to hell” and even designed pictures of what Buckingham Palace and other British landmarks would look like under Islamic rule, and were treated to well attended press conference to unveil these pictures as if it were some kind of nouveau art exhibition. Furthermore, the UK and foreign media have regularly described Anjem with esteemed titles that the Muslim community would never use of Anjem, such as being described in the media by titles such as ‘Islamic cleric’, ‘Muslim Imam’ and ‘Islamic scholar’. This had the effect of position Anjem in the minds of the wider public as a person of significant influence in the Muslim community. People have pointed out that while the Muslim community banned Anjem from mosques and shunned him, the media gave Anjem the oxygen of publicity he so craved. AM and Anjem greatly benefited from the media and politicians disproportionate amount of attention on them, as they found that the more hatred and anger they caused in wider UK society against Muslims, the more Muslims in the UK became disenfranchised due to suffering from the resultant Islamophobia from Anjem’s outbursts, which consequently lead to easing new government measures and laws to clampdown of speech and political dissent in the wider Muslim community. AM and Anjem revelled in playing the public villain, and no doubt hoped this would garner more attention and sympathetic support to his group (little though it still was) from disenfranchised Muslim youth. In response to the recent criminal conviction of Anjem, and the questions being raised as to why it took so long to prosecute him, claims have come to light by Metropolitan Police insiders explaining that their investigations into Anjem were continually blocked by Mi5 – for their own purposes. It has long been suspected by many individuals in counter-terrorism circles, that Anjem Choudary was protected from prosecution by the security establishment, and exploited for a well known counter-terror tactic called a ‘Honey Pot’, to attract into Anjem’s circles, individuals who were already inclined to violence and terrorism and be able to monitor them and arrest them. Indeed, many studies have shown that some individuals have a greater predisposition to violence, and this was certainly bourne out in the violent backgrounds of many of the individuals, like the killers of Lee Rigby who associated themselves with AM and Anjem Choudary. If this is true, then Anjem’s outrageous rhetoric and provocations where cynically deemed by Securocrats as useful to the government counter-terrorism strategy. Some have argued that Anjem has proven useful to the government and securocrats in other ways. His consistent provocation and praise for individuals involved in terrorism, has arguably helped decrease impediments in UK public opinion that would have raised objections to new UK government terror legislation. Four new terror laws were passed in the UK before the 7/7 terror attacks, while since 2000, there have been nine Terrorism-related acts passed by UK parliament, a new law for almost every other year. In 2014-2015, the UK government tried unsuccessfully to introduce new controversial ‘extremism’ laws that would outlaw non-violent speech – which many cited Anjem Choudary as a suspected justification for it. Unfortunately for the Muslim community, the conviction of Anjem Choudary hasn’t ended the specter of more laws being imposed. Anjem’s conviction is being used to introduce more. Many media outlets are now reporting questions being raised as to why Anjem was allowed to preach extremism for 20 years. Anjem, once again, is being used as a gimmick to pass more legislation, this time, a controversial ‘Extremism Bill’ that targets ‘non-violent extremism’, which is a euphemism for peaceful political dissent, especially related Islamic ideas in the Muslim community which are deemed contradictory to Secularism. The media and politicians over-focus on AM and Anjem had the effect of portraying them as the face of the Islamic political movement in the UK, which effectively helped detract from the other much larger movements, like Hizb ul Tahrir, Muslim Brotherhood, Salafism, Tablighi Jamaat etc. Pursuant to this, Anjem Choudary becomes a convenient tool to strawman all non-secular Muslims who do not believe in Secular reformation, who they pejoratively call ‘Islamists’. Of course, many have noted that Anjem provided, quite conveniently, a useful pretext for many Islamophobes, Neo-conservatives, Conservative politicians and Secular Liberalists to further their agendas with regards to counter-terrorism, immigration, the Muslim community and restricting peaceful political dissent within the Muslim community. This is now evidenced again, by those self-same media platforms, politicians and militant Secular Liberals exploiting the situation, and raising the question why it took so long to convict Anjem Choudary – arguing that his ability to radicalise and threaten comes mainly from his ideas – ‘political Islam’, ‘Islamism’ and ‘non-violent extremism’, implying quite deliberately that they would like to see laws and policies change to change further to more palpably silence these ideas and all ‘those’ who ‘share’ them. The UK government, and many ‘counter-extremists’ still use the flawed and debunked ‘conveyor belt’ thesis, which states that ‘non-violent extremism’ is a ‘gateway’ to violent extremism. The theory goes that the Islamic beliefs in a Caliphate, Sharia and one global Ummah (Muslim community) is ‘extremist’ and ‘plays a role’ in radicalising a Muslim into committing terrorism. It therefore follows, that in order to ostensibly prevent violence, all individuals or groups professing such beliefs must be clamped down upon by some means – social or legal. Despite, and perhaps because, their is no empirical evidence of these beliefs causing radicalisation, Anjem Choudary and AM serve as a useful ‘example’ touted by the UK Government and government connected ‘counter-extremism’ think tanks like the Quilliam Foundation. An alleged statistic of a reported 50% of terror plots in the UK, is claimed to have involved individuals who at some point known AM or Anjem, and is then wheeled out and used as an example to demonstrate this theory is ‘true’. Firstly, ‘non-violent extremism’, simply isn’t extremism – violence has usually been taken as the yardstick to define extremism, and should be the only concern of the UK government. Secondly, correlation doesn’t equal causation. Anjem’s acquaintance with many people who go on to commit terrorism, merely shows his ability to attract such people because of AM’s history of glorifying terrorism and Anjem’s high visibility (and media-helped) public platform to issue such provocative messages. Naturally we’d expect troubled and violence prone individuals to seek Anjem out. As the preponderance of academic studies show, Radicalisation into violence, usually depends quite a deal on an individuals pre-existing disposition. Many violent individuals were already on the path to violence, before they joined groups such as Anjem’s. This meant that Anjem has acted more as a lightning rod for these people, not an agitator who creates violent tendencies out of previously peaceful and mentally stable individuals – a fact Mi5 is alleged to have taken advantage of. Maajid Nawaz, head of the Quilliam Foundation, tritely argued ‘[Anjem Choudary] highlights the dangers of theocratic Islamism morphing into violent jihadism, because that cancer was left unchecked to spread within our communities for so long’. The fallacy of Nawaz’s argument is evident when people study the history of AM, and its founder Omar Bakri Mohammed. They’ll discover that when Omar Bakri arrived in the UK, and coeval with his setting up of AM, he already was heavily involved in international ‘Jihadism’. AM, from its very inception, had always been supporting violence and terror attacks – it never embraced it at a later day. Another member of the Quilliam Foundation, strangely argued on BBC Radio 4: “Anjem is actually a very nice person…extremism can take individuals that are perfectly normal, perfectly good people and turn them into monsters…that’s the power of extremism” he then continued describing Anjem as “a nice human being”. Of course by ‘extremism’, Maajid Nawaz and his colleagues have said they refer to ideas like the ‘Caliphate’ and Sharia as the basis of law, which they fallaciously argue is an idea shared by extremists. But simply believing in a Caliphate no more predisposes a Muslim to violence, any more than believing in the English law, USA law or the concept of a nation state predisposes someone to far-right nationalism, totalitarian government and fascism. Professor Hugh Kennedy, a well known medieval historian and writer in his book The Caliphate wrote: ‘The idea and ideology of caliphate demonstrate that this ancient idea still has power and authority in the Muslim world…caliphate is a concept with a wide variety of meanings and interpretations. Its strength lies partly in its flexibility. Its intellectual justification draws on the direct connection with the earliest days of Islam and the glorious era of the Umayyad and Abbasid caliphates. At the same time it can be used, even twisted, to promote ideologies which are sinister and brutal. But the idea of Caliphate is not in itself dangerous or threatening. We need not be afraid of it, even if we are fearful of how some have chosen to interpret it’. Let’s look at former organisation of Maajid Nawaz, Hizb ul Tahrir, a far larger organisation than AM ever was, with a global membership, that also campaigns for a Caliphate (albeit in the Muslim world) and sharia as the basis for law. How many of their members or former-members have committed acts of terrorism in the UK? or even globally? None. According to the hypothesis of ‘counter-extremists’, we should’ve seen a much larger number of violence arising from HT than from AM. The fact that we have no credible evidence of this, even one case, is clear evidence against this hypothesis. A leaked classified UK government report even affirmed this, and observed that groups like Hizb ul Tahrir do not lead to violent radicalisation, and in fact may even act as a safety valve for Muslim grievances. If this were science, the ‘non-violent extremism gateway’ theory would have been cast into the bin along with the flat earth theory and the theory that the sky is held up by the Greek mythological Atlas. However, the ‘nonviolent extremism gateway’ theory was never a theory that was seriously believed by policy makers, but only intended as an easy-to-use excuse without which it becomes harder to silence legitimate opinions and peaceful groups. Like a magician’s trick, that makes you focus on one area, while the real trick happens elsewhere, the real concern of those exploiting this issue, is actually around issues of immigration and fears over Muslim loyalty and resistance to cultural assimilation into a Secular worldview. David Cameron said with regards to ‘non-violent extremism’ that: ‘it is a worry for the world that some feel allegiance only to a religious brotherhood, instead of to their fellow citizens in nation states’. The absurdity of the politics and arguments being made around Anjem Choudary almost matches the absurdity of Anjem himself. The problem here, ultimately, are the misplaced accusations, demands and questions by those using the criminal conviction of Anjem Choudary to push their own agendas. Questions are raised about the need for new terror laws to prosecute an individual who was already successfully prosecuted by existing terror laws. People are demanding legislation to help security agencies speedily put people like Anjem in prison, despite he reportedly only being delayed from prosecution at the request of security agencies themselves. Anjem is claimed to have been a major radicaliser of people, but his publicly well known message of hatred and violence only attracted people whose personalities were already inclined to this. Secularist ‘former-extremists’ claim that it is primarily an ideology and not other factors, that radicalises people into violence, despite the ironic fact that they themselves in their past, and the thousands of peaceful Muslims today they accuse of following this ideology, never became radicalised into terrorist violence. But most damningly, the Muslim community is blamed for an individual they shunned and ejected, while the media heavily promoted him becoming the only source of oxygen for his career. In the end, the real ‘beneficiaries’ of Anjem Choudary’s work, in terms of getting the policies and public opinion that they’ve called for, have been the UK government, the right-wing media, Islamophobes, the far-right, neo-conservatives and intolerant Secular Liberals. Coincidentally, these groups have been the same ones who have constantly spoken about Anjem for years keeping him continually present in the public mind, and providing him with platforms that maintained his problematic high public profile. If ever there were a group deserving of blame for Anjem Choudary’s highly visible career, it is only them. “But most damningly, the Muslim community is blamed for an individual they shunned, but whom the media heavily promoted – and unwittingly were the real source of support for his career.